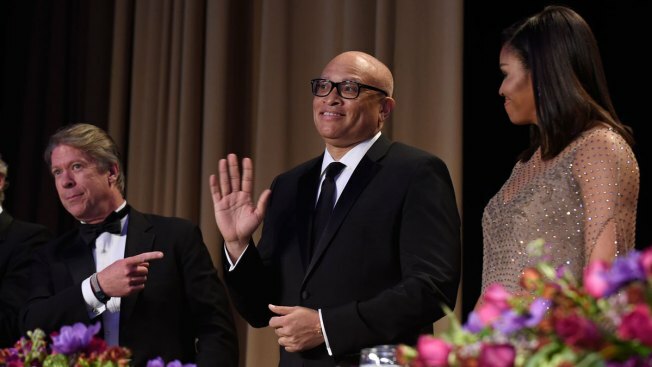 Larry Wilmore, guest host from Comedy Central, center, waves as he is introduced at the annual White House Correspondents' Association Dinner. Major Garrett, left, of CBS News and Michelle Obama, right, watch. "The Colbert Report" debuted nearly 11 years ago with Stephen Colbert playing his conservative blowhard character and introducing the concept of "truthiness" – twisting the truth to make a disingenuous point. Colbert's Comedy Central time slot replacement Larry Wilmore debuted on "The Nightly Show" just over 1 1/2 years ago, playing himself and introducing the concept of "Keep it 100" – telling the truth to make an honest point. Both men effectively used smart humor in different ways to keep things 100 percent real. But now, the reality of ratings has claimed "The Night Show," which ends after Thursday night's edition. That's a shame for fans of Wilmore – and of quality late night TV comedy. He tackled race and politics amid a period of high-stakes turmoil, generating laughs and insight. As he put it on Monday's installment: "Our show was at its best when the news was at its worst." But Wilmore's best wasn't enough to draw a large, young audience amid tough competition that included Colbert's CBS show, Jimmy Fallon, Jimmy Kimmel and Conan O'Brien. His mature, thoughtful approach to putting the craziness of the day into perspective didn't pack the flash of fellow "Daily Show" alumni John Oliver and Samantha Bee, who benefit from a weekly schedule. But he produced a solid, intelligent show four nights a week. Part of the program's charm came from his nightly panel of guests, a throwback to Bill Maher's old "Politically Incorrect" that included some interesting groupings (like 50 Cent and Judd Apatow last year). Wilmore would ask provocative questions – and ask his guests to "keep it 100," handing out stickers to those who gave unvarnished answers deemed genuine. He also mixed in fresh comic talent, most notably "Nightly Show" regular Mike Yard. Wilmore was at his best, though, during his opening segments, with targets ranging from Bill Cosby (check out his searing "The People v. O.J. Simpson" parody skewering the embattled former sitcom star) to Bill O'Reilly (witness how he spun himself into the Fox host's "No Spin Zone"). He also memorably headed to Baltimore last year to interview gang members amid protests after Freddie Gray died in police custody, offering context to the unrest. While praising Wilmore, Comedy Central President Kent Alterman told Variety that "The Nightly Show" hasn't "resonated with our audience.” But Wilmore clearly connected with more than 750,000 viewers, not an inconsiderable crowd these days. With time, Wilmore’s audience might have grown via his election-pegged bits, dubbed "The Unblackening." Wilmore also provided a complementary counterpoint to Trevor Noah's increasingly high-energy take on "The Daily Show." While the 32-year-old South African comic doesn't command the audience Stewart did, he does turn out Internet-friendly material. That was never a strength for Wilmore. His top viral moment – using a variation of the N-word to address President Obama at April's White House Correspondents' Dinner – became steeped in controversy. On his show Monday night, a gracious, but clearly disappointed Wilmore handled the news with humor. He observed that the end of "The Nightly Show" means "racism is solved – we did it!" He was kidding, of course, but here's the 100 about Larry Wilmore: He stayed true to himself and his audience. Even amid a crowded late night TV comedy landscape, his strong comic voice resonated by always keeping it real. Jere Hester is Director of News Products and Projects at the City University of New York Graduate School of Journalism. He is also the author of "Raising a Beatle Baby: How John, Paul, George and Ringo Helped us Come Together as a Family." Follow him on Twitter.